Do you ever wonder why some brands outperform others on social media? Let’s take a simple example of the famous furniture brand IKEA. When it comes to furniture, we wonder why IKEA is one of the most reliable furniture brand compared to other similar famous brands in the market? Now, as an individual actively searching furniture on social media, he or she may come across a number of other brands promising to sell much better quality and uniquely designed furniture; however, as a prospect, the moment your eyes fall on something which has an IKEA tag on it, it readily attracts your attention. And before you know it, you are either ordering it or taking down the product number, screenshotting from the catalog and driving to the nearest IKEA store. What makes IKEA so unique as compared to so many other brands trying to outshine in social media? If you ask me; It’s all about how businesses place the right product on the right time at the right place and at the right price in front of their respective customers. Introducing, the fundamental principle of the 5Ps of Marketing in the world of Social Media. What are the 5Ps of marketing? Ask yourself, what is the ultimate goal of all marketing practices introduced within an organization? If it isn’t to drive sales to your respective business. The 5 Ps of marketing are robust tools that can help you generate a good amount of profit within no time. Maximizing profit and sales are two goals which are heartily desired by every other organization on the enterprise development block. And with these 5Ps of marketing strategies implemented in place, any organization can significantly achieve that and more. These marketing practices can be successfully implemented any marketing channel including social media. The major foundation of any business is the product or service which they are selling into the market. Therefore, it is usually considered one of the first Ps among the 5Ps of marketing. You can start away with defining the different features of the product which can include different options, packaging, features, and sizes. Related: This 2019's Social Media Guide has all the Image Sizes that you need to know! Once, you have brainstormed how the product may look like to your clients and customers, then you need to identify its increasing benefits, how it is going to help others and how it will make you stand above the competition. When it comes to social media, it all depends on how you can make it attractive for the customers. The second P of the marketing mix is how you intend to place the product in front of the customers. Here, you can brainstorm how you choose to deliver the product or service to your targeted customers. In social media, placement of the product is all about placing the product proficiently in front of the customer. When businesses are capable of perfectly placing the product, they become quite successful and earn a credible amount of bounty over every sale they make through different social channels. Deploying the perfect placement strategy requires a consistent observation. Businesses which are successful in designing the perfect placement strategy often becomes a successful story in the world. The third P in social media marketing is one of the most relevant tactics. Businesses which invest their time and budget in optimizing the promotional channel for businesses often climb the stair of successes within no time. A good promotion strategy make use of fun ideas and tactical brainstorming. It outlines all the important advertising channels which an individual can use and allow people to completely understand the product. For instance, it challenges the mind of an individual to understand how they are going to promote. You can assemble all your relation strategies and similar ideas under a single platform and then review them from a personal perspective. A powerful promotion strategy can work wonders for any business. When you are selling a product into the market, then it becomes increasingly essential that you are dot point sure about the price at which you are planning to sell. A good price is one such which is neither too expensive nor too cheap that it deviates the mind of an individual. To analyze the best price for the product, there is no harm in performing a bit of research before you decide on which one suits best. A good average price is the median of your overall product marketing strategy. In case, you have successfully designed the most perfect product but you’re not capable of setting the price right, your business can suffer a great amount of loss and you will end up wondering where you have gone wrong. Last of the Ps in marketing has emerged just over a decade ago. The P for people indicates how brands are now valuing people in their marketing brands. By personalizing information brands nowadays are planning to deliver a more focused experience to different individuals who are interacting with the brands. In case, you are someone who walks up to an online social media platform and suddenly realize that you are interested in a product, it is important that the brand should already be prepared to help you deliver the service you have in your expectation. Keeping this in mind, brands are now focused on delivering experiences to customers which are now more centric towards delivering them state-of-the-art products. These five Ps of the marketing mix altogether help brands boost their business effectively. They help modern-day marketing individuals to strategically position a business on social media in a particularly competitive market and polish it up in such a way that it outshines other brands on the block. Modern day managers and product owners want to control the satisfaction level of their customers; hence, they utilize a mix of marketing strategies to convince clients and customers so they may purchase products and services from them. By leveraging the power of the 5Ps of marketing, managers and product owners make investments in adding value to their businesses. They introduce different innovative elements which may help differentiate their brand from other potential competitors in the market. If your social media campaigns are not meeting the expectations of your customers, then you are definitely losing some potential clients and profitable business. It is time that you strategize your social media marketing strategy and re-evaluates it from the perspective of the 5Ps of marketing. 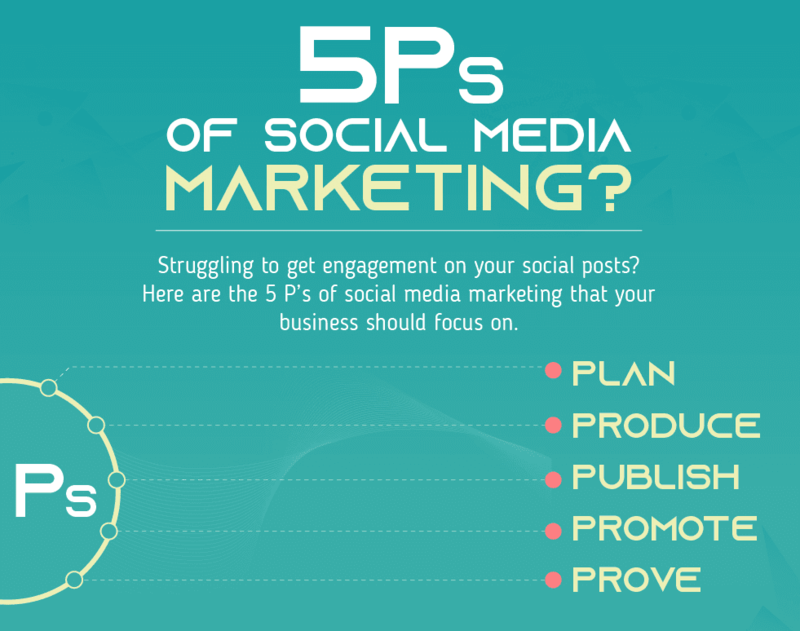 Branex has created an interesting infographic on 5 P’s of Social Media Marketing that can help you establish that and build your focus on customers.